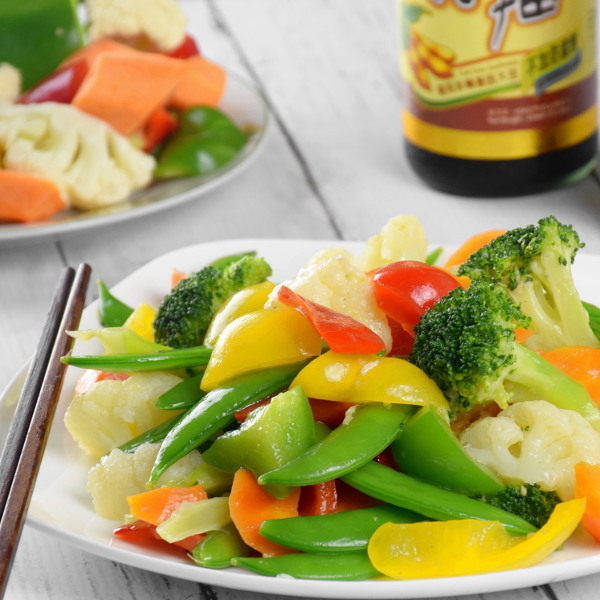 Vegetable stir-fry is a quick and easy Chinese dish. Stir-frying adds a whole new dimension to your plain vegetables, only if you do it right. 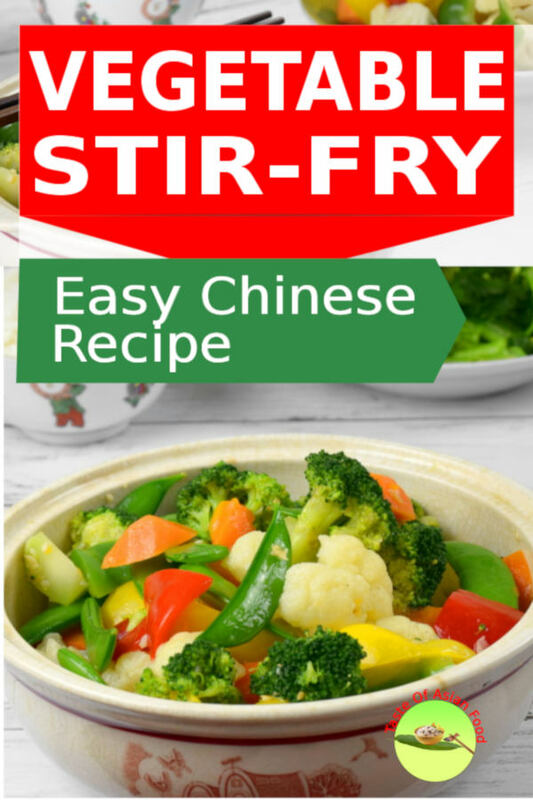 In this article, I want to explain how to prepare Chinese vegetable stir fry in detail. Your lustrous, gorgeous vegetable stir fry with remarkable texture will knock your socks off. You will recognize immediately the ineffable taste that you are familiar with at the Chinese restaurant. 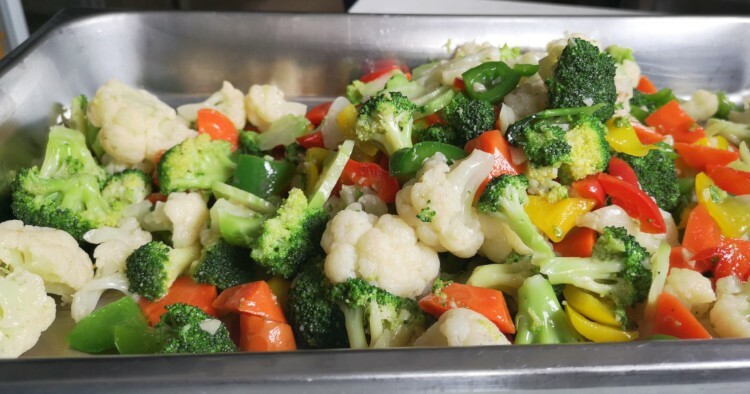 In this recipe, I am using five common vegetables to prepare the stir-fry- broccoli, cauliflower, capsicum, snow peas and carrots. Broccoli. Cut the stem off close to the head so that the forests will fall away as florets naturally. Discard the lower part of the stem which is usually hard and fibrous. Cut the more tender part of the stem into slices or wedges. This section is full of flavor, so I suggest you should not throw them away. Take a look at the surface of the cauliflower, if it develops some small black specks on the surface, remove it by using a vegetable peeler before cutting. It is easier to remove the black specs before cutting than after. Snow peas. Remove the ‘string’ of the snow peas that is tough and fibrous. To do this, pinch the curly end of the snow pea, pull it along the pod al the way to the other end until it separates from the snow pea. Carrots. Peel off the skin of the carrots. Cut the carrots into wedges by cutting it at an angle and turn it a quarter after each cut. Capsicum. Cut the top and bottom away. Then you can remove the core and seeds quickly as it is still intact as one piece. Cut the capsicum into larges slices of triangular shape. Shorten the time required for stir-frying.Since stir-frying is a quick process, the time involved is not enough to heat through some vegetables, for example, a wedge of carrot. Blanching is even more relevant when you want to ensure the bigger florets of cauliflowers and broccoli are cooked. Furthermore, prolonged frying will cause the vegetables became yellowish and lost the bright color. I regularly blanch them and only stir-fry the vegetables over high heat briefly. Set aside for later use. This method will destroy the enzymes which will discolor foods and cause them to deteriorate. By doing this, the color will maintain even though after a few hours. You can also get this done a day before, and store them in the refrigerator until the following day. Brings a pot of water to a boil. The amount of water has to be at least three times the volume of the vegetables. When the water is boiled, place the carrot wedges into the water. Let them cooked for three minutes. Once the carrot pieces are half cooked, add cauliflower and broccoli florets into the water. Keep the water at a consistent boil for two minutes. Add the snow peas and boil for a one minute. Use a fork to pierce into one of the broccoli florets. The broccoli and cauliflowers are just done when the fork can slide in and out smoothly. The snow peas should by now crisp and cooked. Lastly, add the capsicums and just let it heat up in the water for fifteen seconds. 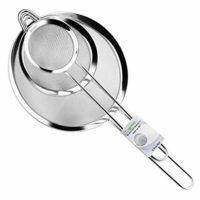 Drain with a wire mesh strainer or colander. Set aside for stir-frying. Shock the vegetables if you intend to keep the vegetables for later use. Otherwise, you may head straight to stir-frying after blanching. Shocking means to throw the vegetables into an ice bath to halt the cooking process immediately. This method stops the vegetables cooking from the inside, which results in a mushy and discolored product. Prepare an ice bath (cold water with ice cubes). Drain the vegetables after blanching. Pour the vegetables into the ice bath immediately. Make a few stir to let the heat dissipate from the vegetables. Let the vegetables cool down for a few minutes in the ice bath, to let the inner part cools completely. Drain and store in the refrigerator. Prepping the stir-fry sauce is simple. I recommend the following basic stir-fry sauce for this recipe. You can make changes by adding soy sauce, sesame oil or change the amount of each ingredient. Noted that I have included cornflour in the formula, which will thicken the sauce. Therefore you do not need to add ‘cornflour slurry’ anymore during stir-frying. There is no time to waste during busy hours in the restaurant. Hence, we make a large batch of this sauce and store in the refrigerator. You can adopt the same concept if you want to prepare a significant portion for your guests for parties by making it in advance. You do not need to blanch leafy vegetables such as bok choy or choy sum. They are thin and can cook through easily. Cut the stem of bok choy and choy sum into thin slices. Stir-fry the vegetables with the sauteed garlic for a minute, then add a little water to cook the stems until they turn soft. Once the stem becomes soft (you can pick one a tray), add the leaves and continue cooking until the leaves wilt. Stir-fry choy sum or bok choy is the most common home-cooked dish for the Chinese. Simple, quick and delicious, all you need is just oil, garlic, salt, and the vegetables. Of course, you can use the same set of seasoning in this article to switch it up. Make a batch of vegetable stir-fry for buffet. You may have watched the Chinese restaurant chef stir-fry over a towering inferno, but in practice, this seems a distant dream to come through in the home kitchen. 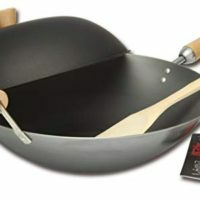 I would very much suggest you purchase a high power wok burner. It is not expensive and is invaluable for stir-frying and many other Asian cooking methods. In the event this not possible, you can still produce an excellent dish by following these steps. Heat up some vegetable oil in the wok (or saucepan). Add a tablespoon of chopped garlic and saute over low heat until it turns aromatic. Here you have two choices. You can just stop short once the garlic becomes fragrant, or continue sauteing it until it turns golden brown (and crispy). If you want the garlic crispy, continue to stir and move the garlic around or else it will tend to stick to the wok and burn quickly. Add the pre-mixed stir-fry sauce and continue the cooking process. The cornstarch is cooked when the sauce turns translucent. You should take note of this as uncooked cornstarch taste awful. After that, add all the drained vegetables to the wok. I will only prrepare Chinese vegetable stir fry over high heat if served immediately. When I prepare it for a large party or buffet, I expect the guests will eat much later. The vegetables will turn yellowish and loss the bright, fresh look. 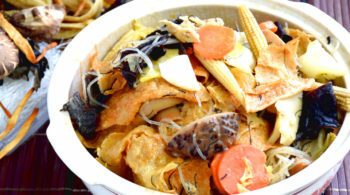 You can adopt this method when Chinese cook vegetable stir fry at home. If you want to serve the Chinese vegetable stir fry immediately, crank up the heat and stir-fry over the highest flame you can muster. Stir fry for a short moment (around half a minute) until you can smell the aroma that you are familiar with in the Chinese restaurant. We called it wok-hei, or means ‘the breath of wok’. If you plan for a party, which you want the vegetables to stay fresh, just mix the vegetables with the sauce in the wok. 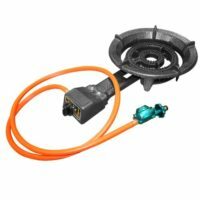 You can leave the flame on but is over low heat. Once the vegetables are coated with the delicious and glossy sauce, remove it from the stove to prevent overheating. The garlic will provide a delightful flavor to the dish, albeit minus the signature aroma of wok-hei. Dish out. 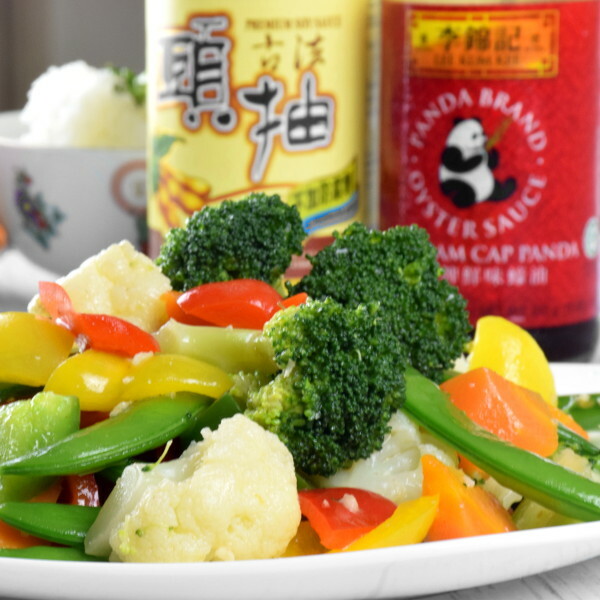 Chinese vegetable stir fry is best to serve with rice or noodles, or just straight out from the wok. 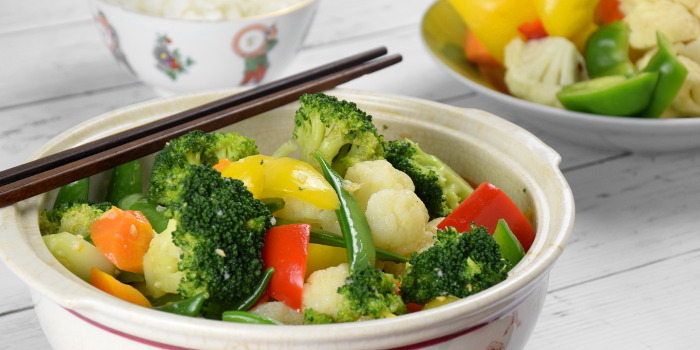 Chinese vegetable stir fry is a quick, easy and delicious recipe. Take only 20 minutes to prepare, Best to serve with rice, noodles or just eat straight from the wok! Peel and cut the carrots into wedges. Remove the stings of the snow peas. Blanch the vegetables. Drained and set aside. Heat up the vegetable oil in the wok. Saute the garlic until fragrant over low heat. Add the salt, sugar, ground white pepper, oyster sauce, cornflour and water. Cook until the sauce becomes translucent. Add the blanched vegetables. Stir-fried over high heat until it turns fragrant. 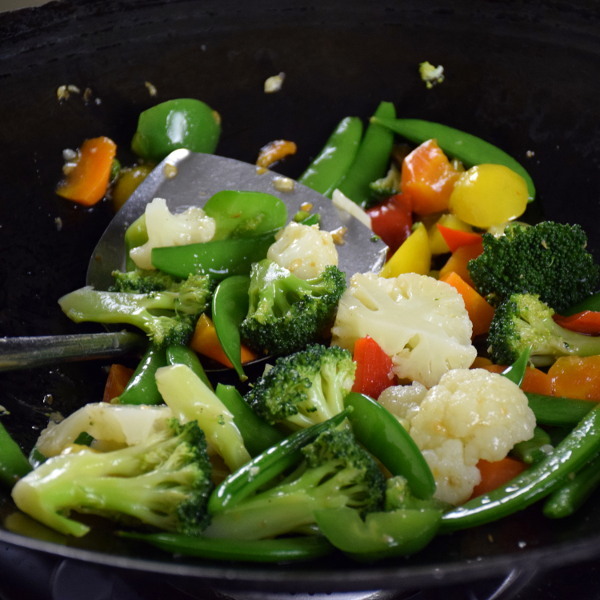 12 replies to "Vegetable stir fry – How to prepare in four easy steps"
KP Kwan, you have explained it very clearly and nicely about how to stir fry vegetables. FYI, I do not use Oyster sauce. Any other replacement you can suggest me. Will it be fine for to use Soy sauce and Chilli sauce? Appreciate your comments. You can use chili sauce, omit oyster sauce, or add something else. What I emphasize here is a general principle, and you make the changes on your own. KP Kwan, thank you so much for your swift response. It’s a great help and my daughter going to enjoy the stir fry today. KP Kwan, thank you so much for your swift update. I used soy sauce and it came out extremely well. My daughter ate and was praising for your guidance. Thank you so much for your detailed information along with the video. It is so much clear and the way you explain it is to the basic which people like me can understand. Have a great day. Really happy to know that your family like how to stir-fry vegetable turns out. What Vegetables Go in Stir Fry - The Secrets of a Yummy Dish! Thank you because my madam and sir really like your recipe I cook..